'Ayurveda' is known as 'Science of life' translating 'Ayuh (r)' as life & 'Veda' as science. Ayurveda is well known as an ancient system of life and also the oldest surviving treatment medical system in the world, basically originated from India. Going back almost 5000 years, Ayurveda is also considered to be an ancient science of cure and healing that enhances longevity and life style. It has evolved from the discovery to have a happy life, through a deep understanding of creation and its practice with maintenance, perceived and conceived by the rishis of ancient India. Ayurveda emphasizes upon life in general with bit more emphasis on human life. Ayurveda's influence can be found easily in many very old traditional methods of healing including Tibetan, Greek, and Chinese medicines thus making it the 'mother of healing.' The fundamentals basics on which the Ayurvedic system is depends are essentially true for all ages and so can be easily adopted time after time, century after century. The philosophy of Ayurveda teaches a series of concept basis systems characterized by balance and disorder, health and disease. Ayurveda teaches that a person's emotional, mental and spiritual being are all inter-connected with together and any kind of imbalance between them results in health diseases and disorder.Therefore, to be healthy, harmony must be exist among the purpose for healing, feelings, thoughts and physical action. Health and disease are defined in a very clear way in Ayurveda. Ayurveda's central tenant is that life is a manipulation of mind, body, spirit and soul. Body and mind are very sensitive to suffering while the spirit is free of any such trappings of life. Thus to be healthy and happy forever, efforts are required to be made in the direction of maintaining harmony among all these elements and only then only one can get closer to the goal of life longevity and disease free life. Only 30% of the diseases have a definite cure. Rest 70% like Diabetes, Blood Pressure, Heart diseases, Cancer, Joint Pains, Skin Diseases, Thyroid, Mental Diseases, PCOD etc. have no cure and the person has to take some medicines throughout his lifetime which can have hazardous side effects. So we are successfully treating diseases like Cancer, Heart, B.P., Diabetes, Arthritis, kidney, Lungs, Liver, Brain, Eye, Anti-Ageing, etc through Science of living, Panchakarma, Okinawa Diet Therapy & 3R-Rejuvenation . Ayurvedic science is not only a traditional, ancient Indian form of medicine but a perennial naturopathic system of healing that has survived the test of time as well as onslaught of latest modern science and methods of treatments. Based on wisdom acquired through the centuries, the main aim of Ayurvedic science and therapy is to achieve flaw less health by creating an equilibrium of perfect harmony between human body and the environment in which it habitats. Ayurveda is also known as the science of living a disease free and healthy life style. It is built on the premise that in olden days, man used to live close to nature and whenever he got exposed to some disease, he used to cure himself using resources and material available surrounding him/her , provided by the Mother Nature. It therefore can not be wrong to say that Ayurveda provide us a health patter based on nature and it's natural resources available in reach. The ancient Vedic philosophy believes that all human beings are a part of nature. Just like animals and plants are inter co-related and dependent on each other to create balance within their beings, there is a concurrent and inherent connection between the universe and human beings too. The complex world that the human beings reside in, is perpetually exposed to environmental changes. Any amount of change in weather, lifestyle, diet, work, emotions and relationships can easily alter the balance and negatively impact on individual's state of mind, body and soul. Ayurveda calls for a complete harmony of human body with the elements of nature and the surrounding environment for a stress free and healthy life. The Ayurvedic science does not merely deal with medical science but its scope goes much beyond the universe of the conventional science. It also includes factors like herbal medicine, body works, and surgery apart from social, psychological, ethical, spiritual and intellectual life of human beings. According to Ayurveda, each one of us has a unique combination of three body principals that constitutes our physical, mental and spiritual well-being. These three principals are known as doshas in Ayurveda, which are further classified as Vata (air-ether), Kapha (water-earth) and Pitta (water). Among all these , each individual has its own unique constitution that is usually governed by one or two of the doshas predominantly. It means, our Ayurvedic constitution is mainly be either of these doshas or a mixed constitution of two doshas like Kapa & Pitta, Vatta & Kapa or Vatta & Pitta. There are the three doshas known as 'bodily humors': vata, pitta, and kapha. 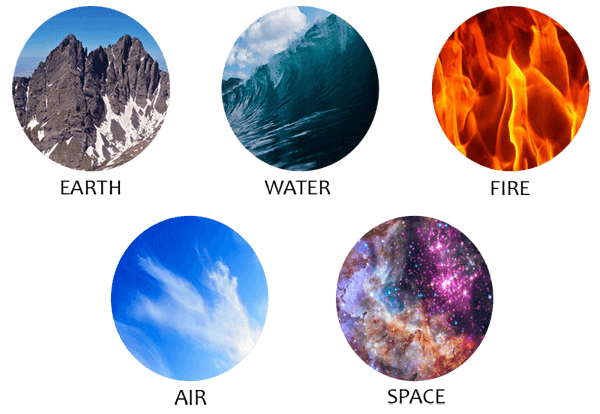 Each of them embodies a particular combination of elements , quantity and qualities to create a functional entity—an energetic force of nature. The doshas, or some combination of them, can be identified in various seasons, activities, climates, landscapes, plants, and animals. In the context of our bodies, all three doshas are necessary to facilitate important physiological functions. But if they go beyond healthy limits (those determined by one's constitution), the doshas can also wreak havoc on our health and body condition. All three doshas are present in every human body, but the ratio between them varies a great deal from one person to the other. We will get back to that in a second, but first, here is an overview of the essential nature and character of each dosha. 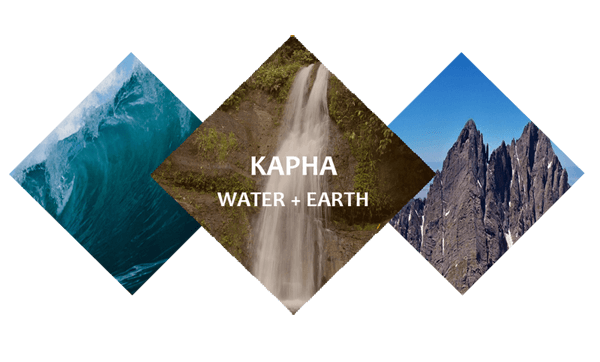 Kapha governs and responsible for all structure and lubrication in the mind and body. It is the principle that holds the body cells together and forms the muscle, bone, fat and sinew. It is highly responsible to controls body weight, growth, lubrication for the joints, lungs and formation of all the seven tissues —blood, nutritive fluids, fat, bones, muscles, marrow and reproductive tissues. It helps build excellent stamina but when it goes out of balance it can also cause a person to become overweight, sleep excessively, and suffer from the problem of asthma, diabetes and depression. 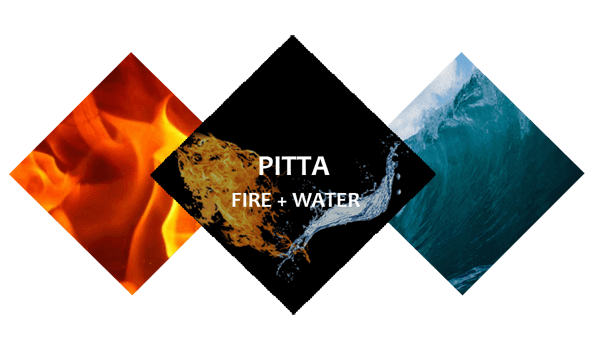 The pitta dosha is responsible to controls metabolism, digestion and energy production in body. The very primary function of Pitta is transformation. Those with a predominance of the Pitta principle have a fiery nature that manipulates in both body and mind. Pittas have a perfect digestion, lustrous complexion, abundant energy, and a strong appetite. When it go out of balance, Pittas may suffer from skin rashes, burning sensations, excessive body heat, peptic ulcers, heartburn, and indigestion. 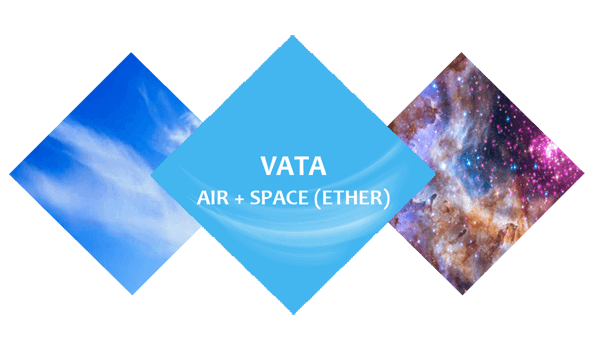 The vata dosha is responsible to all the movements of mind and body. From controlling the blood flow to elimination of the waste and harmful toxins to breathing and the flow of thoughts in the mind; the vata dosha is like a predominant force that minimizes stress and feeds the creativity within you. If the vata dosha is in balance, you will feel enthusiastic, energetic and lively but the moment it becomes imbalanced, it manifests in the body problems like hypertension, constipation, fatigue, digestive challenges and restlessness among other part of the body. According to Ayurveda, your constitution of the body (prakriti, in Sanskrit) is the particular combination of pitta, vata and kapha that is established within you at cemented at birth, conception and that remains constant over the span of your lifetime. It represents your natural state of equilibrium, your blueprint for perfect health, and it influences your your physics, physiology, your likes and dislikes, your mental, your tendencies and habits and emotional character, as well as your vulnerabilities toward disease and imbalance. Therefore, understanding your constitution of the body can be truly enlightening. But if pitta, vata, or kapha become imbalanced, and the baseline state of the health is disturbed, the doshas can also cause a great deal of harm and disturbances of body language. When this occurs, recognizing which doshas are at play and where they have accumulated is a critical very first step in discerning how to return to balance or it's previous state. This is why your current state of balance (vikriti, in Sanskrit), which reflects the current level of the doshas in your system, is equally important as well as necessary. In contrast to one's body constitution, the current state of balance can and does change over and over time, as we move through different climates, different seasons,different zones and the various stages of life. It is also impacted by our daily life style routines, diet, relationships, exercise, stress levels, and our evolving life circumstances. In fact, it is common for one's present state to undergo minute changes from one day to the next, or even over the course of a single day. Together, your body's constitution and your present state of balance provide an invaluable context from which to consider your path forward to the daily life. An Ayurvedic practitioner uses all of this available information to identify and track down the root cause of any departure from one's natural state of equilibrium, and to evaluate & determine how balance can best be restored shortly. Human Body is made up of various cells which grow in numbers with age and after reaching adulthood, cells start dying and that leads to deterioration of body functions which cause ageing and can be identified by measuring the biological age. Other body parameters like Body Fat, Blood Glucose level are also important for metabolic syndrome. Science of Living enables to maintain an ideal body structure and keep the various body parameters under control to prevent occurrence of chronic diseases and remain young life long. Ayurveda understands health as a result of reflection of a man living in harmony full with nature and disease arises when this harmony gets disturbed by external causes. In the very old times, rishis believed in Ayurvedic herbs as the solution to cure a various of health issues and diseases. The conducted thorough studies and experimented with these all herbs before arriving at any point of conclusion regarding the accuracy of the medicinal values of all these herbs and their effectiveness in treating number of ailments and diseases. Due to their natural resources, Ayurvedic herbs are considered to be free of any side effects and thus celebrate a global appeal and attention. Ayurvedic medicines are commonly formulated using a mix of various particular herbs and other plants, including oils and common spices. By combining in appropriate amount of several kinds of plants and herbs to get benefit of the drug or therapeutic value, Ayurveda has proven itself capable of overcoming various health related problems that occurs in the body. 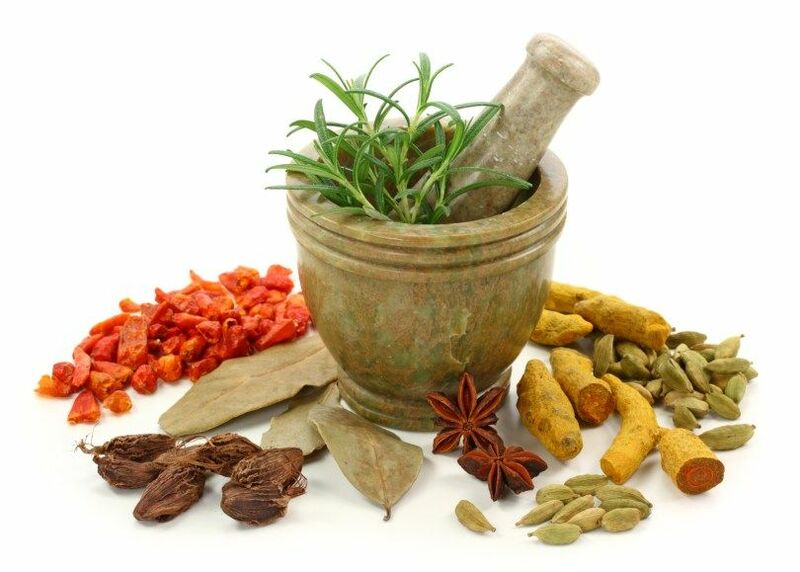 Today, Ayurveda is being widely used in modern medicine systems frequently. This was supported and triggered by a number of research-conducted by scientific research centers and has proved how effective and positive the role of plants or herbs can be on human health and life. Herbs play a very important and vital role in the Ayurvedic system and a small herb is known to dissolve even stones in the kidney,gall-bladder and bladder easily and effectively. Apart from timely cure, Ayurvedic herbs are also know to provide permanent relief from a disease by removing the metabolic toxins from the body. Ayurvedic remedies are preventive as well as protective and curative in nature. As the emphasis is on using herbal and natural ingredients or things that can be easily found in the kitchen, it does not pose any danger of being toxic. The remedies also emphasize on the need for a lifestyle change with modification required in one’s diet, sleep pattern and other basic everyday activity. Therefore, the holistic approach towards the overall well-being of a person is more enough effective as compared to other traditional forms of modern day science. 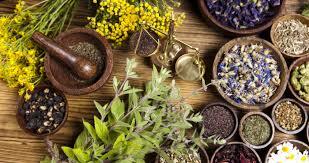 Ayurvedic Medicines are very fast gaining popularity across the world. One of the major reasons for it being that Ayurveda seeks to normalize body functions with various techniques practices including advice on food and physical activity, internal herbal preparations, purification treatments (panchakarma), and surgical methods (shalya chikitsa) and yoga. Ayurveda is based on the belief that the delicate balance of mind, body and spirit which determines health and wellness of the body. The goal of Ayurveda is preventive as well as advancement of the body's own capacity for maintenance and balance. Ayurvedic medicines are not only non-invasive but non-toxic also in nature and therefore are free from any kind of side effects. Using Ayurvedic medicines in your daily life capable and enable you to re-establish balance and harmony in body's functioning system, aids in detoxification and cleansing of the body by removing accumulated toxins and normalize body's functions. Edible Products made using Ayurvedic plants/herbs have a stronger action on the body as they help in stabilizing the all doshas. 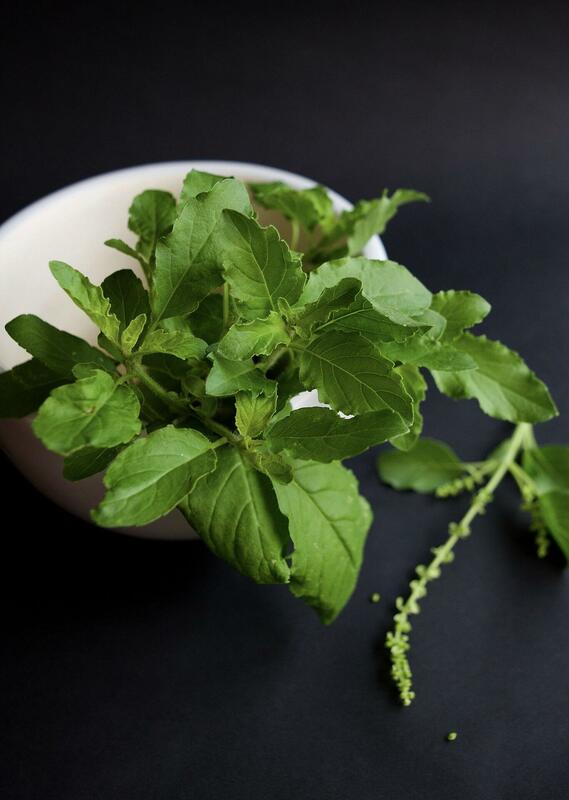 Tulsi (holy basil), Guduchi,Shilajit, Ajwain, Brahmi and Ashwagandha etc., are some of the most frequently used herbs in Ayurvedic preparations. Each of these herbs or spices carrying a multitude of benefits - for the body, mind and spirit and can be easily used externally or internally, depending on the needs. The gunas are essential part to understanding the Ayurvedic principle that like increases like and that opposites balance. For example, a person who is particularly cold natured, surviving in a cold climate, in the middle of winter, is likely to be experiencing an aggravation of the cold quality. The remedy? Heat—in the form of hot drinks, warming foods, soothing baths, heating spices, snuggly warm clothes, and if possible, an abundance of heart-warming experiences. At the heart of the Ayurvedic approach towards wellness is an idea that like increases like and that opposites balance. So, whether we are trying and attempting to mitigate the bad effects of certain innate vulnerabilities, or trying to find out and correct an active imbalance, we can apply the energy of opposites in order to steer our bodies in the normal and right direction. The all twenty qualities mentioned above provide the very important straight-forward illustration of how the various concept works, and their grouping into ten described pairs of opposites makes for a fairly intuitive grasp of how this wisdom of Ayurveda can be applied in practical terms. A patient with aggravated pitta can invite a return to it's prevous stage or balance by minimizing exposure to the qualities and quantities that provoke pitta (sharp, hot, liquid, light, spreading, and oily) and by increasing contact with the slow, cool, dense, heavy, stable, and dry qualities that balance pitta . The time when we can able to know which qualities, in particular, are aggravated, we can be even more precise and clear in our treatment strategies. For instance, if this same patient were suffering from acidic indigestion and a short temper, we could try to focus on balancing the hot, sharp qualities with calming foods , cooling and herbs while cultivating more slow, relaxed experiences throughout each day. The beauty of the Ayurvedic approach is that it is as elegant and intuitive to the novice as it is the well experienced Ayurvedic practitioner. For those relatively new to Ayurveda-especially those who are willing to cultivate enhanced self-awareness and health consciousness around their habits, strengths, and vulnerabilities-the tradition practitioner offers a clear path to improved wellness and vitality. The same set of fundamental and basic principles guides the skilled practitioner of Ayurveda in directing potent remedies to specific tissues, organs and channels throughout the energetic and physical bodies. There are, of course, some universals in Ayurveda: practices that are commonly understood to be beneficial for all of us, regardless of constitution of the body or current state of doshas balance. These include things like eating whole/partial foods, proper food combination, and following a traditional Ayurvedic Daily normal life Routine-which might involve cleaning your tongue upon waking, practicing yoga or meditation daily, and soothing your system periodically with a exotic and loving oil massage. But if you follow only common principles, you may inadvertently limit Ayurveda's extraordinary ability, advantage and benefits to specifically support you and your changing life style's needs. Remember, your constitution reflects the normal and ideal ratio of pitta, vata, and kapha in your body system. However, if any of the doshas are out of balance from current state (and for most of us, at least one of them is), your ayurvedic body constitution is not the entire story. Your current state of balance may actually be more important because it highlights which doshas you need to pacify in order to return to balance, and can help you identify the effective treatment strategies for your particular situation. Ayurvedic doctors regard mental existence, physical existence, and personality as a unit, with each element being able to influence the others. This is a pure holistic approach used during diagnosis, curing, therapy, and is a fundamental aspect of Ayurveda. Another part of Ayurvedic treatment says that there are channels/source (srotas) which transport fluids, and that the channels can be opened up by massage therapy or treatment using oils and Swedana (fomentation). Unhealthy channels are main thought to cause disease. Generally Ayurveda has 8 ways to diagnose and find out illness, called Nadi (pulse),Jihva (tongue), Mootra (urine), Mala (stool), Shabda (speech), Druk (vision), Sparsha (touch), and Aakruti (appearance).Ayurvedic practitioners approach diagnosis and treatment by using the five senses. For example, hearing is used to observe and analyse the condition of breathing and speech. The study of the lethal points or " marman marma " is of special importance. 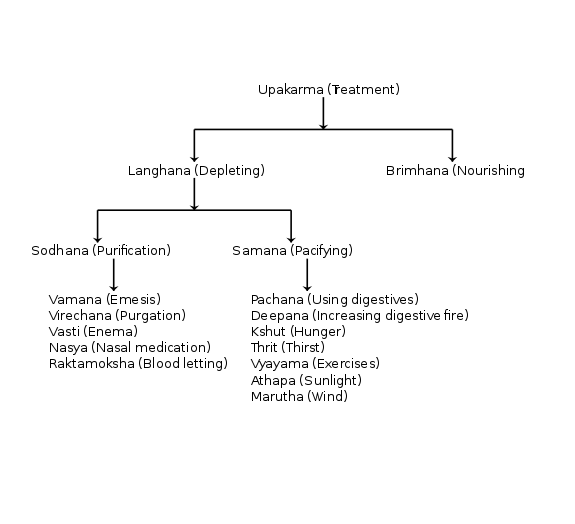 Mainly two of the eight branches of classical Ayurveda deal with surgery (Śalya-cikitsā and Śālākya-tantra), but contemporary Ayurveda tends to stress attaining vitality by developing and building a healthy metabolic system and maintaining good digestion and excretion of the food intake. Ayurveda also focuses on exercise, meditation, and yoga .One unique type of prescription is a Sattvic diet. Ayurveda follows the concept of Dinacharya(Daily life style), which says that natural cycles (waking, working, sleeping, meditation etc.) are very important for health. Hygiene, including regular bathing, skin care, cleaning of teeth, and eye washing, is also a central practice.